Week thirty six equaled TONS of naps. I would say on average I took at least two naps a day for two hours at a time if not more. Basically at this point I’m a professional napper. Sleeping at night is overrated when you can just nap all day. You might be thinking with all that napping it’s no wonder you don’t sleep at night. NOT true. I’ve always been great at napping and still sleeping at night. Sleep at night is far to painful with my swollen feet and hands. Not to mention it was too cold to go anywhere or do anything, not that I had any plans to begin with. I did get out a few times when I wasn’t napping. Mom and I went to Sam’s Club bright and early on Tuesday where I managed to trip out of the car on my reusable bags, then after gathering myself, a few minutes later I somehow spilled my coffee all over the place. Good thing it was outside so I didn’t make a complete mess in the store, but my pants and fleece weren’t so lucky. Thursday was another doctor’s appointment and a little overwhelming for me. I tested positive for strep b, which is no big deal except I have extreme (that may overreacting a little, but when you can’t take any of the “good drugs” to cure colds, any allergy is extreme) antibiotic allergies/sensitivities. All of the recommended antibiotics I’m either allergic or tested resistant to. Out of the top ten, I stopped having a reaction at number six. Antibiotic allergies aren’t something new in my life, though I’ve noticed they have worsened as I’ve aged. The only thing that scares me a little bit is that I have no idea how I’ll react. Hopefully we’ll mesh well. I also had to get tested for preeclampsia because my blood pressure was higher than normal and the swelling in my hands and feet isn’t getting any better. That made me more nervous than anything. My doctor is fantastic and assured me it was just to be on the safe side, but I am one of those let’s jump to the worst conclusion types of people. The phlebotomist (learned that word from teaching medical terminology) is super funny so she too made the best out of the situation. I did get a little teary once I got to the car, but a reassuring phone call to the hubby and a text to Brianne made things better. I took the doctors advice and after finishing up some errands went home, put my feet up, watched TV and took a nap. Around 5:30 she called to let me know that all is fine I must of just had an off day, but to keep the resting and fluid intake up. From the amount of resting I’ve been doing, that is no problem!! No huge plans for the weekend. We had dinner with KSquared on Friday night at Napoli’s (LOVE that place). It was YUMMY like always and it was great to catch up. After all, Katie and I no longer get to spend quality time together daily! Saturday Ben was supposed to work out of town, but due to the weather he ended up home. It’s so weird to have him home on the weekends. I almost felt like I didn’t know what to do. For so long we’ve had weekends “apart” per say, with either one of us doing our own thing that when we are both together for the weekend it’s weird. We did take the opportunity to make a trip to Menard’s and get the rest of the stuff needed to finish the nursery (pictures to come next week). Around 2 I got to go hang out with Tyler while Cuz and Tim went on one last date before their baby came. It has been a long time since I’ve baby sat, but let me tell you it was so much fun. Ty is such an easy kid and at a super fun age. I for sure thought being nine months pregnant I’d be exhausted by the time I left, but it felt good to run around with the little guy. I think he had fun with me too!! Sunday I felt great and spent the day going through all the crap that is piled up in our office. We really are hoaders. The worst part about our office is that it’s rarely used. Our clean laundry spends more time hanging out in there than we do. I’d hope at some point in our life that we’ll actually use it for more than a dumping grounds, but I don’t see that happening anytime soon. Maybe if there were a TV occupying the space I’d spend more time in there. Ben did scold me for “overdoing” it and cleaning out cupboards that are out of arms reach. His first comment was, “you must have grown 8 feet tall in order to clean that cupboard out.” I told him not only was no one around to help me, but the cupboard wasn’t going to get cleaned on it’s own. Now everything is exactly how I want it to be. Baby is the size of a Honeydew. Weighing in at approximately 4.2-5.8 pounds. 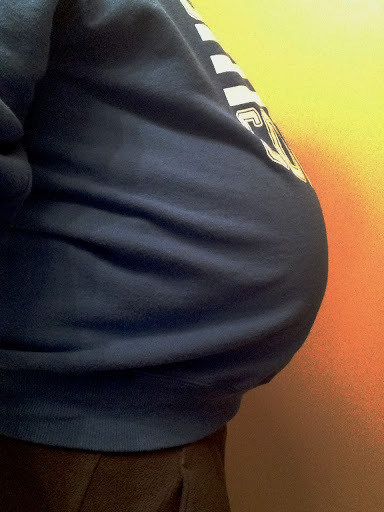 The Doctor seems to think we’re going to have an “abnormally large” baby. Pardon the “boring” pics this week. I was trying out some different apps on my iPad. 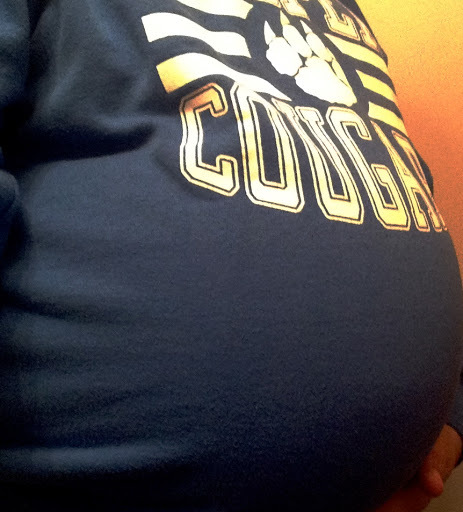 For those of you wondering, yes that is a vintage Cooper Cougars sweatshirt that I proudly wear on a regular basis!! Maternity Clothes: They’re overrated at this point. Most of them don’t fit or are far too uncomfortable to even attempt to wear. Hence the reason I only wear them when I NEED to go someplace. So don’t be surprised if you happen to see me ‘repeating’ outfits on a regular basis. The rest of the time it’s my pj’s and over sized shirts. Though I’d like to add, just because I stay home all day and enjoy my pj’s does not mean I don’t shower on a regular basis! Miss Anything: At this point it’s hard to think of something specific that I miss as I kind of miss a lot of things, but most of them are things that are expected to be missed this far in. It will be nice to have a “normal” body again and to do “normal” things. Anything Making Your Queasy or Sick: A sour tummy a few days this week. Not sure from what, but it was just like first trimester all over again. Labor Signs: Since we’re getting to the point of weekly checks and closer to the due date there could be lots of things going on, BUT to keep the excitement alive we’ve chosen not to disclose any of that. So if you ask, “are you dilated?” my response will be no, even if I am. Where’s the anticipation of surprise if I spill all the details?! ?Belly Button: Popped is an understatement. Happy or Moody:Excited, anxious, unpatiently waiting….